My Beatport DJ chart January 2015 is available! Some tunes are included in my Soundcloud Mix January 2015 aswell! My Soundcloud Mix January 2015 is available! My Soundcloud Mix Series is back with 17 fresh tunes mixed into just one hour! It features tunes and remixes by artists like Liquid Soul, Scott Bond, Will Rees, Bryan Kearney, Critical Choice and many many more! Stream+Download enabled, enjoy! Tic Tac Trance #085 Replay available! Happy New Year! I hope you all had a good start into the new year and that most of your goals will be accomplished! 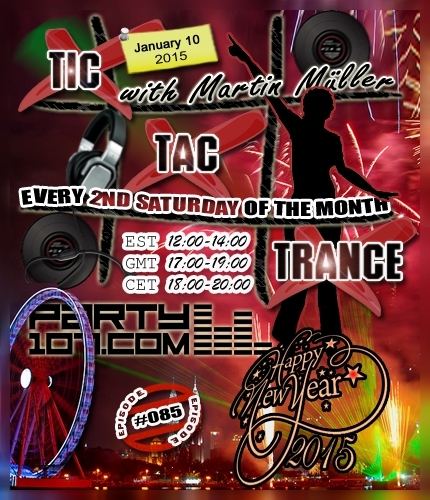 Episode #085 of Tic Tac Trance will be broadcasted on January 10 2015 on Party107.com. This time I’ve prepared an uplifting & psychedelic 2 hours mix which features tunes of labels like Damaged, Discover, Unique Sound, Monster Tunes, Iboga and many many more! Make sure to tune in!